Below is the headboard of one half of my old bunk beds. I have more memories of this bed than I can tell: illicit post-bedtime reading, experiencing life-altering forgiveness and a whole host of things never to be blogged! I love to reuse old furniture – why buy a new bed when you (or, to be more precise, my parents) already have one? So when it was time for my three-year-old to move to a ‘big girl bed’, it seemed only right to give this old bed a new lease of life. The old pine bed had been stained to match the floor in our first house and so it had a fairly traditional orangey/brown ‘antique pine’ finish. 1. My first job was to sand down the bed thoroughly, paying particular attention to the detail. 2. I gave it a good wipe down with a damp cloth and then dried it with a clean, dry one to get the surface as clean as possible. 3. Using a good quality wood primer, I gave the bed its first coat of paint. It was pretty tricky painting it disassembled as each piece did not really stand alone. If I were to do it again I would definitely assemble it and then paint it but as I was painting it as a surprise for my daughter, I did not have anywhere I could leave it up. 4. 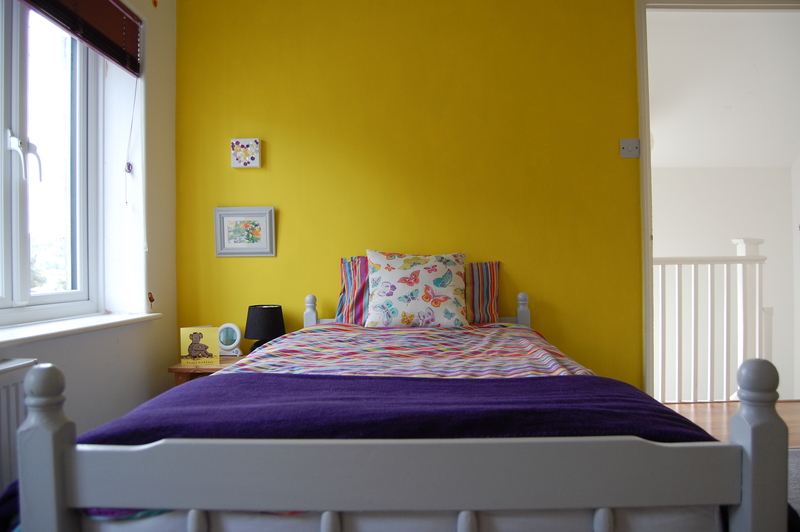 My local paint suppliers mixed up a light grey paint for me – it wasn’t cheap but it went on beautifully. It took two coats for the coverage to be decent. 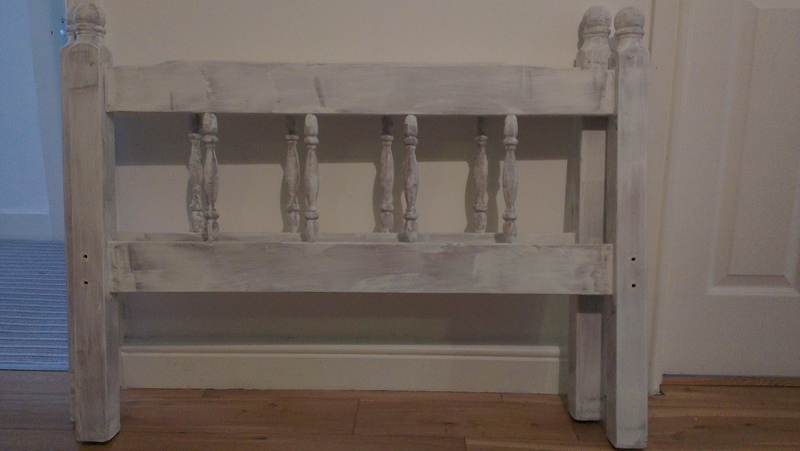 If I hadn’t been in a rush to get the bed finished for my daughter’s birthday, I would have given it a light sand in between coats, and perhaps given it another for a more durable finish. As you can see from the picture above, my daughter and I painted an old picture frame with some of the leftover paint. Hi, I was wondering which type of paint you used? Looks fabulous. Hi. I used my local trade paint suppliers who colour matched it to Dulux’s Mineral Haze 2 in diamond eggshell (which is good for wood that has been previously stained or painted). Thanks for the feedback!